“Yumm… greens and beans,” said our buddy Joe Spallina, inhaling the simmering pork and rosemary in my version of Scarola e Fagiole, a thick, aromatic soup of escarole and white beans. Joe is a technology wizard and pays my husband, Richard, and I an occasional visit, bestowing lessons and imparting kernels of wisdom to assuage our computer-challenged angst. He’s never ruffled by our knitted brows, the insults we hurl at our dispassionate screens. He doesn’t take this bad behavior personally. The very least I can offer is a dish I think he’d enjoy. His grandparents would have certainly approved my choice of pancetta. Both of Joe’s grandparents migrated to America from Sicily. I worried they might have taken offense to the liberties I took with my interpretation of this most beloved classic, particularly enjoyed in cold winter months. But my changes weren’t too extreme: I used leeks instead of onions and added fennel to the brew. 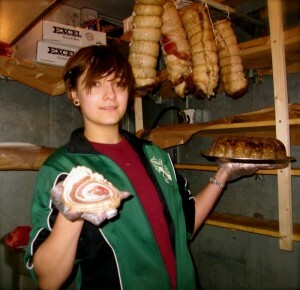 She explained that the Sparrow philosophy is doing as much work with their meats, in-house, as possible to have a controlled, clean product. Simmer aromatics in olive oil, then add stock and soaked beans. Purée half the cooked beans with an immersion blender or food processor. Escarole, a member of the chicory family, is considered a winter green because it grow in cooler climates. Stir escarole ribbons into the brew and cook until tender. To make the pancetta, she cures slabs of pork belly. The thick meaty pork seasoned with juniper berries, thyme, bay leaf and brown sugar imparted unctuous flavor to the soup I made. If fat is a concern, I left the pieces large in the following recipe, so they could be removed with ease — or not — before serving. The pancetta will have done much of its work. It may also be diced after removing and used as a garnish, as pictured above. Escarole, a member of the chicory family, which includes frisee, endive and watercress, is considered a winter green because it grows in cooler climates. At this time of the year, my palate tires of the root vegetables and gourds of the season, and I crave greens such as this. Common in European kitchens, escarole is not readily found in American produce departments; it’ an unfamiliar green to many of us. Pity our produce managers, in their efforts to keep Ann Arbor’s multi-cultured palate appeased, as well as conform to a store’s profit margin expectations. I fear escarole is one of those items that ends up as “grocery shrink”, or rather “loss.” Pity our palates, as well, for I’ve grown to love the slight bitterness of escarole, and I appreciate it’s delicate firmness when cooking. I’ve noticed Hiller’s regularly stocks escarole in the winter months when I’m craving this green. For a quickie version of this soup, saute garlic, pancetta and pepper flakes in olive oil, stir in ribbons of escarole with a pinch of salt, and when wilted, add stock. Bring to a boil, simmer 10 minutes, then add canned white beans. Simmer an additional 10 to 15 minutes, or until escarole is tender, then smash some beans against the side of the pot the thicken the brew. Serve with grated Parmesan. 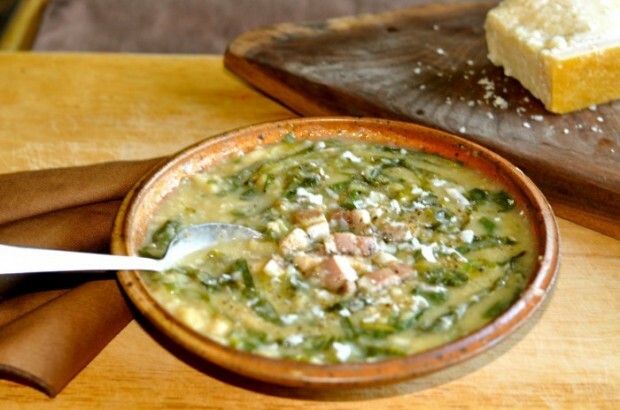 Scarola e Faciole; a palliative soup, a soup of therapeutic nuance and marvelous flavor that will soothe your winter soul, reminding you of our ancestor’s great creations in the days long before iWhatevers.